I'm sitting here at one of those park bench tables they have in campgrounds, willing the sun to drop so it will cool down a little. A stilt takes a walk through the wetlands of Kakadu, Note the interested croc on the left! 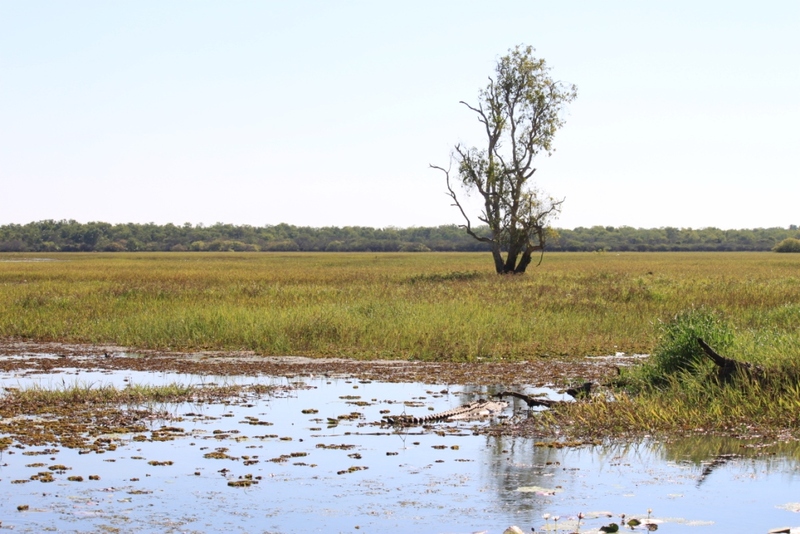 We're in Kakadu National Park, Australia's stunning, 20,000 sq km icon, a place of waterfalls, rivers, escarpments, billagongs, wetlands, walking trails, and heat. Kakadu doesn't do cold. It has six seasons, according to Aboriginal lore - cool dry, hot dry, stormy, hot wet, misty, and monsoon. We're in the hot dry. It's 34 degrees in the shade - what there is of it - and it's a dry heat. So dry I went and stood in the campground shower before with my clothes on half an hour ago and they're dry again already. 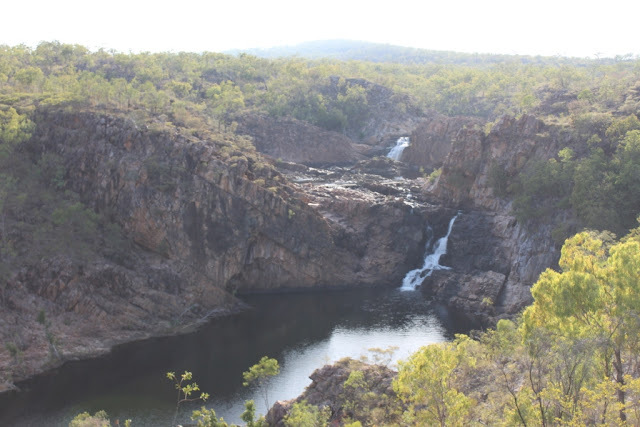 Apart from the heat, Kakadu is nothing short of incredible. The park supports hundreds of varieties of birds and other wildlife, picturesque lakes and rivers, stunning waterfalls with plunge pools you can dive into without any fear of touching the bottom. And crocs. Lots and lots of crocs. 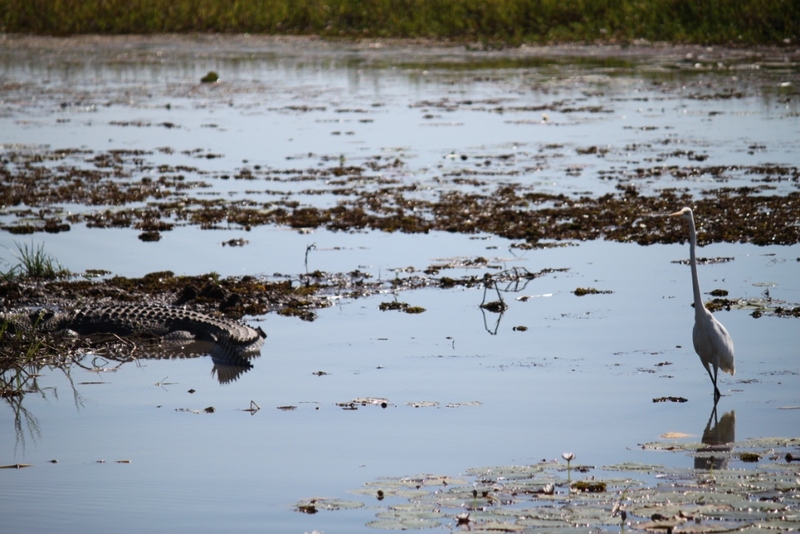 We went on a riverboat cruise today on South Alligator River (named by some European who thought the crocs were alligators). There they all were, dozing in the sun, 5m-plus of lethal killing machine. Our tour guide told us just how powerful the jaws of a crocodile are. I can't remember exactly how many pounds per square inch it was, but it was a lot. 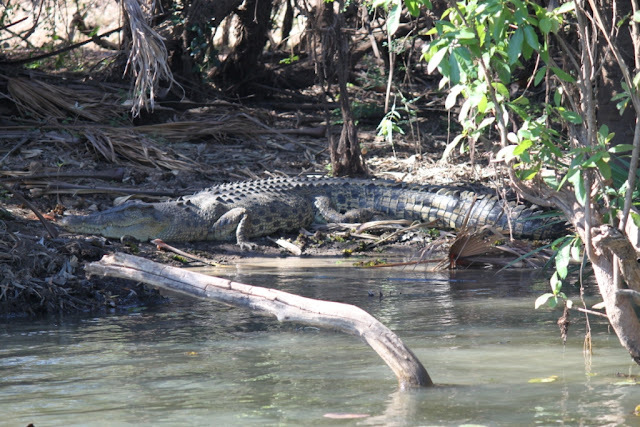 The locals say if you are either unlucky enough to fall in a croc-infested river or stupid enough to swim in one you've got about 30 seconds from point of contact with the river to goodnight nurse. Fortunately, there are those plunge pools, hundreds of metres up above the rivers, where you can call off - although even then, the signs make it perfectly clear that you swim at your own risk. The thing is, when it's boiling hot and the water is lovely and cold, it's sometimes hard to make a rational decision. But so far we've been OK.
Kakadu sits around 300km or so south of Darwin. We got here through the back roads, through Limmen National Park, another awesome stretch of Northern Territory wildnerness. It was around 400km of nothingness, but it had its own fragile beauty - particularly Butterfly Springs, an oasis in an otherwise barren and dry land. The Northern Territories does things its own way. It's the only place in the country where mining is permitted in national parks for example - cue hue and cry from the greenies - and it has an open road speed limit of 130km. Until 20 years ago, there was no speed limit at all - the locals weren't very impressed with the imposition of 130km, although I have to say the average vehicle around here doesn't look capable of it anyway. It's also the first place I've come across where there's a limit on how much booze you can buy in a day. Basically, it's a couple of bottles of wine, or a bottle of spirits, or a slab or two of beer. The details are entered into a computer, matched against your licence, and if you try to buy any more anywhere in the state on the same day, you're out of luck. The system was originally introduced to try to curb alcoholism among aboriginals but it now applies to everyone, and unless you're planning a massive party I think it's a pretty good idea. We've now reached the half way point in our journey to Perth and we've already covered 9,100km. I can't wait for Alice Springs and the Tanami Desert, while my girlfriend is looking forward to the beaches of western Australia. So little time, and so much to see.